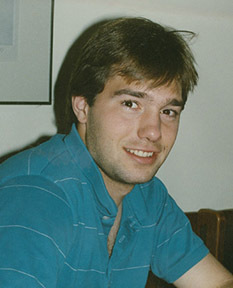 Abstract: The Richard Paul Monetti Family Papers contain materials related to Richard "Rick" Monetti, one of the 35 Syracuse University students killed in the bombing of Pan Am Flight 103 over Lockerbie, Scotland on 21 December 1988. Richard Paul Monetti (1968-1988) was among the 270 victims of the bombing of Pan Am Flight 103 over Lockerbie, Scotland on December 21, 1988. He was a junior at Syracuse University's S.I. Newhouse School of Public Communications considering a career in journalism, although he also had an interest in history and political science. A native of Cherry Hill, New Jersey, Rick was survived by his parents, Robert and Jennie "Eileen" Monetti, and his sister, Kara Monetti Weipz. In a passage from his journal recovered in Lockerbie titled, "Rick's Philosophy of Life, or, What I've Learned in 20 Years," Rick wrote: "a good attitude is worth five points; don't sit back, make the most of everything. Do all you can while you can. Life is a one-time deal." After Rick's death, Bob and Eileen joined with families of other Pan Am Flight 103 victims in founding the Victims of Pan Am Flight 103, Inc., and became heavily involved ensuring the airline industry maintains and improves safety measures, one of the organization's primary goals. As of spring 2015, Eileen was a member the group's Care and Concern Committee, and Bob was a member Advisory Board. Bob previously served as editor and publisher of the group's newsletter, TruthQuest. The bulk of the Richard Paul Monetti Family Papers pertains to the Monetti family's work with aviation security and Victims of Pan Am Flight 103, Inc. Bob Monetti represented the Victims of Pan Am Flight 103, Inc. on the Department of Transportation Aviation Security Advisory Committee [ASAC], was involved with the American Association of Airport Executives [AAAE], served on the FAA Baseline Working Group, and worked with the staff of the McLaughlin Commission on Aviation Security and Terrorism. Clippings contains materials the Monetti family collected from newspapers and magazines on various topics including the bombing of Pan Am Flight 103, Libya, other bombings and attacks on civil aviation, and aviation security. Committee work includes agendas, meeting minutes, reports, and working documents from the committees and subcommittees with which Bob Monetti was involved. Conferences consists of papers collected from conferences and symposiums attended by the Monetty family. Correspondence includes both the incoming and outgoing correspondence of the Monetti Family. Materials are separated by corporation or office when significant, and are otherwise filed in chronological order under general correspondence. Court cases contains are all the legal court transcripts and documents included in the collection. Memorabilia consists of a T-shirt, pin and certificates related to the Monetti family's work with aviation security. Memorials and remembrance contains the pamphlets, programs, and other printed material from services, organizations, and places of remembrance dedicated to the victims of Pan Am Flight 103. Photographs includes prints and negatives taken during various organizational dinners, meetings, and memorials. Printed materials includes newsletters, publications, and reports collected on aviation and airport security collection by the Monetti family. Richard Monetti personal belongings series contains all the materials in this collection belonging to, or directly related to Rick Monetti. His belongings are divided into 9 subseries: Clippings, Comic books, Correspondence, Journals, Memorabilia, Memorials and remembrance, Photographs, School materials, and Vital documents. Clippings include newspaper articles about Rick. Comic books contains Rick's collection from his teenage years, and his handwritten collection list. Correspondence includes letters and cards, both incoming and outgoing. Included is Rick's personal correspondence, as well as condolences received by the Monetti family following his death. Rick kept journals while a student and copies of some of these, including the journal from his fall 1988 semester in London, are contained in this subseries. Memorabilia contains a program from a KISS event that Rick attended. The Memorials and remembrance subseries includes materials from Rick's funeral and various memorials, including memorial scholarships established in his honor. Photographs are of Rick Monetti, as well as those he took while studying abroad in the fall of 1988. Rick Monetti's School materials are further divided by high school and college. Included are folders and notebooks from Rick's school years, as well as other materials relating to his school work. Vital documents and insurance information constitute the final subseries. Please note that some materials within the Vital Documents and Insurance folder contain graphic subject matter. Subject and research files contains reports and research, mostly dealing with civil aviation and aviation security, collected by Robert Monetti. Please note that some of this material is restricted. Some materials in the Richard Paul Monetti Family Papers are restricted. Folders containing restricted material are noted in the inventory below. Please contact the archivist for further information regarding the access to these materials. The Richard Paul Monetti Family Papers were donated by Bob and Eileen Monetti between 2010 and 2014. This collection is fully processed and is housed in acid-free folders and archival boxes. Materials are in chronological or alphabetical order. RESTRICTED: Please note that some materials in these folders are restricted. RESTRICTED: Please note that all but the October 1996 folder contain restricted material. RESTRICTED: Please note that some materials in this folder are restricted. RESTRICTED: Researchers are restricted from accessing the floppy disk. Please consult an archivist to inquire about access. RESTRICTED: Please note that materials in this folder are restricted.